Global warming is now an accepted fact. Its consequences for humanity are widely debated. When it comes to attributing the cause of any particular disaster there’s always room for doubt. What’s not in doubt is the human and economic disaster caused by typhoon Haiyan when it hit the Philippines archipelago last weekend. At a maximum sustained wind speed of approximately 195mph, Haiyan is credited to be the strongest tropical typhoon to have hit land in recorded history. Airports, towns and villages were flattened, trees uprooted and rice fields flooded while more than a third of the country's provinces have been left without power and half of them without any communications. It’s now known that forty-one of the Philippines’ eighty provinces have been severely damaged, with almost 30 provinces left without electricity and 15 broken telecommunications. At the time of writing the preliminary number of missing, according to the Red Cross, is 22,000. Meanwhile the United Nations estimates more than 544,600 people have been displaced by the storm and nearly 12 per cent of the population is directly affected. Behind this, of course, is another familiar side to this story: the richer you are the better chance you have of surviving a ‘natural disaster’. The fact that there are houses to loot confirms what pictures of Tacloban and its surroundings show. Businesses, malls, government buildings and mansions are still standing. The city’s country club is virtually undamaged. By contrast evacuation centres proved ‘inadequate’. As Ian Bray of Oxfam put it, “People knew what to do, to go to evacuation centres, but the evacuation centres had to be evacuated.” (Financial Times 12.11.13). Why? Because in the main these buildings were flooded. Clearly the emergency procedures were inadequate. We now have the technology and expertise to build typhoon-proof houses and buildings for these types of events. There are some low cost solutions for remote areas. These systems will sustain less damage during typhoons, saving lives and allowing rapid, low cost reconstruction, and could involve modular construction techniques. This only emphasises what we already know. There is a huge gulf between what could technically be put in place immediately to counter disasters and the reality of capitalist society where the lives and well-being of ‘the poor’ are increasingly expendable. If human beings really did live on this planet as a collective human community, without the poisonous divisions of state boundaries and the obscene discrepancies in overall quality of life which class society imposes, then we could think in terms of people responding as fellow humans to aid their fellow creatures in the event of natural disasters. Apparently food and other goods have simply been stacked up at the airport in Tacloban. The usual reports, impossible to corroborate, of ‘anarchy’ and looting abound. What is for certain is that thousands of people are living out in the open and many places have yet to see any aid organisation. There is no reason to suppose that the donations of ‘ordinary people’ in response to appeals by charities run by well-paid executives and well-meaning volunteers ‘on the ground’, are any more likely to reach their destination than in previous disasters. We have always taken that kind of approach but over the past 10 years, we have put more emphasis on it -- says Mr Stavridis, a former head of US Southern Command. In the same pattern of imperialist manoeuvring, Japan is sending a record 1,000 personnel to support the relief operation on top of $603,000 worth of supplies. In addition Japanese companies have announced their own donations. No prizes for guessing how Japan views China’s rise and its increasing claims to territory in the South China Sea and beyond. Clearly, it’s not the humanitarian crisis that really matters for the major world powers. More important for determining how much aid is donated is how much the allegiance of any particular state is valued in the effort to control their own sphere of interests. 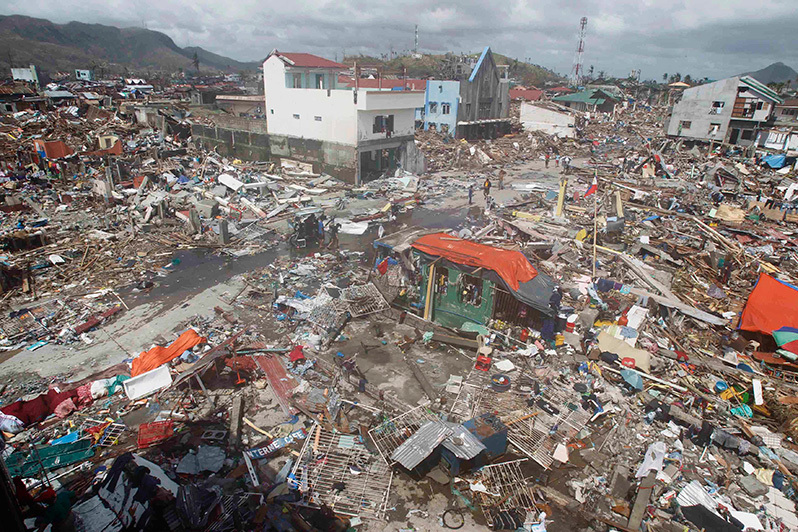 And, as in every other major disaster — the Indian Ocean tsunami, Hurricane Katrina, the Haitian earthquake, we can be certain that a large part of any aid will be siphoned off and the people who most need it left with little or nothing to ‘rebuild their lives’. Meanwhile, the powers-that-be continue their decades-long wrangle over what to do about climate change. They now more or less accept that measures must be taken to limit global temperature change to no more than 2°. Pity that most of the experts agree that this is a nigh on impossible target. While Typhoon Haiyan played itself out UN climate change talks were being held in Poland (Europe’s largest coal producer and biggest carbon emitter). They were discussing the outline of an eventual agreement to be signed in Paris in 2015: how many years it would take to come into play, whether or not it would be obligatory and the mechanisms of such an agreement… If it ever happens it will be irrelevant. Whichever way you look at it, capitalism is incapable of safeguarding the future of humanity. This class society based on a parasitic few living from the value of the unpaid labour of the world working class, which can only reckon in terms of monetary profit and loss, which confines humanity within the artificial but lethal barriers of nation states is well overdue for overturning. Even now it’s not yet too late. The working class still has a world to win. Of course the working class still has a world to win, but that can only be done by 'ordinary people'. So what is really being implied by the statement in the article as follows ? :- "There is no reason to suppose that the donations of 'ordinary people' in response to appeals by charities (...) are any more likely to reach their destinations than in previous charities." Let's be clear on this; is the ICT advising that we should not donate to disaster charities, because of exploitation within them ? If so, is the ICT then saying that the only way that 'ordinary people' can do anything to help workers suffering in the disaster areas is by supporting the ICT itself, financially and in other ways ? There is a long way to go in the developing of intentions of socialist solidarity, so can workers of good-will do something immediate in respect of major disaasters today ? We don't need to be rich to do that. Even one or two books to a charity shop might help. I don't think there is any advice for individuals here (that's up to them) but there is a political comment on the reliability of charities with their megabucks directors. Mention of not advising individuals as regards to whether or not to donate to charities which have megabucks directors calls to mind the whole question of initiatives within the capitalist world. As things stand at the moment, it is doubtful if anyone would bother to set up any 'business' unless they reckoned that they would make at least some money out of it, if not megabucks. Then there is the argument within bourgeois ideology, why shouldn't those who set up and direct 'successful' businesses 'do well' out of it ?! The lack of the possibilities of taking initiatives under former so-called 'socialist' states partially led to such events as the fall of the Berlin Wall. However, as all that may be, for all those people overwhelmed by natural disasters, the receipt of urgent practical assistance is no doubt less important than questions of whether or not it would be even more if less was siphoned off from funds raised. Whether or not they would get more aid and quicker, if the economy of the world no longer used money, is probably not their question just now. What is really being implied is that ‘ordinary people’ should use their common sense about whether, when and what to donate to charities. It is evident today that most charities are run as professional organisations, including ‘career paths’ for employees and a body of well-paid officials. Partly as a consequence of this, only a portion of each donation actually goes to the cause being collected for and a variable portion goes quite simply to maintaining the salaries etc of the bureaucracy . The extent of this rip-off varies greatly and some are more ‘fit for purpose’ than others. Apart from this aspect, there is also the familiar question of how much of the well-meaning donations actually reach their destination. Now we are in the territory of graft and corruption, especially at the receiving end. Don’t just take my word for it, there are tons of reports, eg. Also, if charity begins at home, there sure is a lot to answer for when it comes to the record of charities’ involvement in the notorious workfare programmes where the likes of the Salvation Army have seen fit to comply with the DWP’s ‘either work for free or we’ll stop your benefit’ blackmail. Check out, for example, what some ‘ordinary people’ of the Edinburgh Coalition Against Poverty have to say about charities in this respect. Thank you to 'CWOer' for further explaining the internal nature of charities, but the question lingers, if potential donors, intelligent or otherwise, don't donate, to what extent will those suffering from natural disasters get help ? Charities might well be regarded as supplying 'sticking plaster' to the wounds inflicted by capitalism and as a result of its inadequacies and neglect, but, there again, such theory is of no immediate help to victims of natural disasters. 'Proletarian Aid' might be organised some day, whether before or after revolutions. This is posted on behalf of CWOer who emailed this to me when unable to accessthe site (error message says that the spam filter is not working and to try late. If anyone else is experiencing similar porblems can they email uk@leftcom.org). "I think you’re forgetting the underlying framework of the article which is that the social organisation of capitalism itself exacerbates the human cost of ‘natural’ disasters, skewing the damage massively towards the working class. This is apart from the system’s patent inability to tackle the effects of climate change. In a higher form of civilisation, where the world really is a human community undivided by state boundaries and class divisions and where supplies and resources can be directed promptly by the self-governing community itself (because production is organised directly according to need and not on calculations of money and profit) then the practical aid and long-term assistance to people and places hit by disaster would be in a different league from today. Typhoon Haiyan is the latest demonstration of how capitalism’s social and economic integument prevents the deployment of resources and technical means that already exist. In other words, the struggle for communism is an urgent and practical necessity. Unlike Oxfam, however, that struggle isn’t about donating money to an organisation … We really demand much more active commitment than that. We can't get away from the fact that communism has to be fought for, both in the realm of ideas and practically as the basis of how to fight in the here and now. In terms of the scale of what's required whether we donate to charities is neither here nor there." The Philippine section of the International Communist Current (ICC) published a short article on typhoon Haiyan but in Filipino language. 1) Donations for calamities from private individuals and concerned organizations have been used by politicians for their electoral ambition and for corruption. 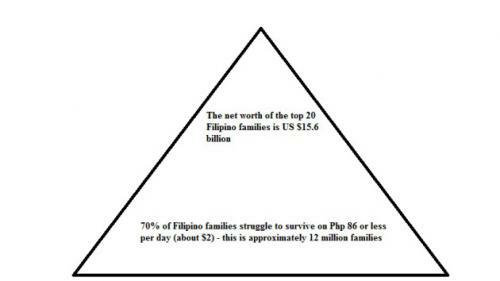 Actually this is the main issue why there is so much delayed in giving relief goods to the victims in Leyte (particularly Tacloban City) and Samar provinces, the two provinces worst affected and damanged by the typhoon. There were cases that the already packed relief goods from other countries had been repacked so that the name of the politician or the government of Benigno Aquino III are there. 2) In addition, bickerings and competition among politicians (administration vs opposition) further delayed the distribution of relief goods. 3) Even the Philippine Red Cross is lead by a politician (Richard Gordon). It is obvious that Red Cross activities are been used for his political ambition. 4) Countries allied with USA imperialism are mobilized to give relief goods. USA itself sent armada of war ships in the name of "relief operation". But behind this "relied operation" is to create a pubic opinion in the Philippines that "without the USA, Filipinos have nothing". This is closely related to the intensification of USA/Japan vs China imperialist rivalry in the Far East. Good post proletariandy. I think you explain the way things work very well. The bourgeoisie has always said that "charity begins at home" which legitimates their tendency to appropriate it all and use it for their own unique and selfish purposes. What is meant by "home" refers of course only to the bourgeoisie's and their bureaucratic pet dogs' homes. And with regard to "without the USA Filipinos have nothing..." Well this is true. 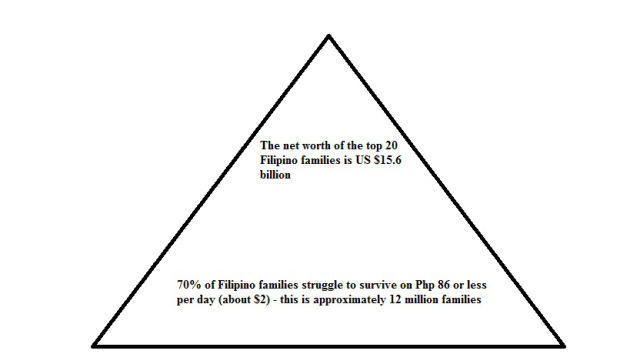 But it's also true that even with the USA Filipinos still have nothing to speak of. We would all do well to realize this and extend this idea to include all national bourgeoisie's, who contribute nothing to us except enslavement to their system, and who appropriate everything the working class produces, except for a few measley handouts called wages. Just as they feel entitled to grab anything that turns up labelled as "charitable relief" or, if they can't steal it will change the label on the packaging to make it look as if the generosity is theirs! We need to give them their marching orders soon.